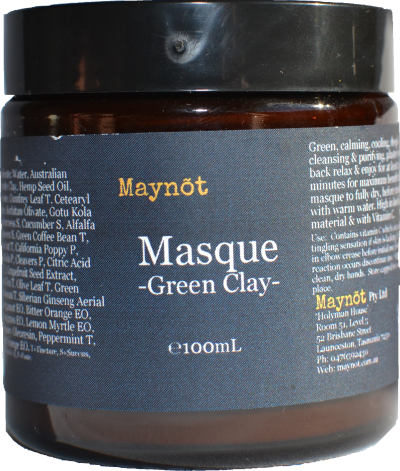 Green, calming, cooling, deeply cleansing & purifying, plaster it on, sit back relax & enjoy for at least 20 minutes for maximum benefit allow masque to fully dry, before rinsing with warm water. High in herbal material & with Vitamin C.
Use: Contains vitamin C which can cause a tingling sensation if skin is lacking. Patch test in elbow crease before initial use, if severe reaction occurs discontinue use. Open with clean, dry hands. Store capped in a cool dark place. Ingredients: Water, Australian Bentonite Clay, Hemp Seed Oil, Glycerine, Comfrey Leaf T, Cetearyl Olivate, Sorbitan Olivate, Gotu Kola S, Watercress S, Cucumber S, Alfalfa S, Cleavers S, Green Coffee Bean T, Green Oat T, California Poppy P, Gotu Kola P, Cleavers P, Citric Acid (Vit C), Grapefruit Seed Extract, Green Tea T, Olive Leaf T, Green Cardamom T, Siberian Ginseng Aerial T, Bergamot EO, Bitter Orange EO, Lemongrass EO, Lemon Myrtle EO, Rosemary Oleoresin, Peppermint T, Sweet Orange EO. T=Tincture, S=Succus, EO=Essential Oil, P=Paste.